A link to a larger version: here. And here's a post deconstructing it at EA. 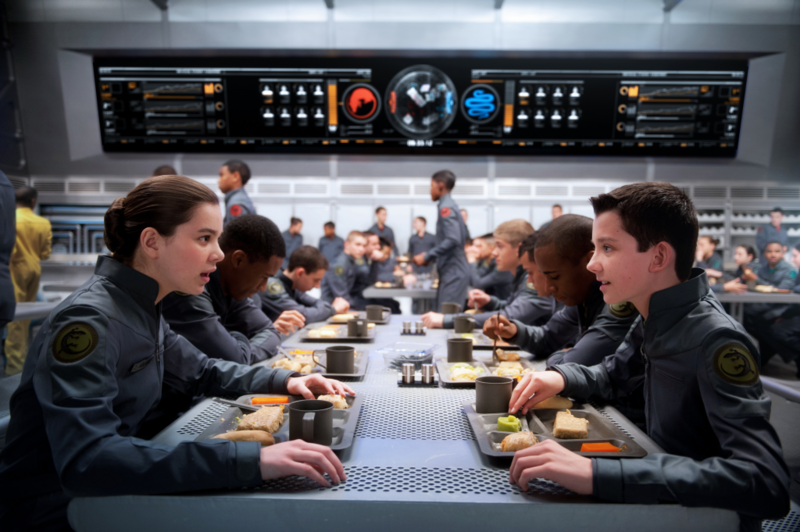 I am soo excited to see this still from the lunch during Salamander Army. I freaked out when my dad showed it to me. Demosth Wiggin wrote: I am soo excited to see this still from the lunch during Salamander Army. I freaked out when my dad showed it to me. That's awesome! What scene are you most interested in seeing? All of them really. But if I had to choose out off all the scenes I want to see the end battle against the Buggers or maybe the battle room scenes. How about you? I'm very excited about the movie but don't all the kids seem kinda old? That bothers me. Like, they're supposed to be about 6 or so but they are and look to be in their teens. I think that's a little old and it really takes away from the child prodigy theme they had going on. Now, when Ender rebels, it'll seem like the stereotypical teen rebellions, don't you think? The actors for the kids are short but while still being short with makeup you can have someone looking like a 10 year old while their 15. Well, yes but no it wouldn't feel like a stereotypical teen rebellion because it wouldn't be like "Oh my god! I hate you dad!" or something like that. It would be more of an outsider kind of rebellion. Where he doesn't want to do anything they say and just be on his own while still knowing what is good and what isn't. If I recall correctly, they changed Ender's age to 12 and condensed the plot to a much shorter time than the book covers. It does take away from the amazing intelligence of the 6-8 year old kids, but necessary for using the same actors for the whole movie. I'm hoping they include things that show how incredibly smart they really are, even for the pre-teens/teenagers they look like. Demosth Wiggin wrote: The actors for the kids are short but while still being short with makeup you can have someone looking like a 10 year old while their 15. Asa is 5ft 8 I think, that's far from short. If Ender is supposed to be 12 he'd be almost freakishly tall. I think (and hope) that it would not be too difficult to persuade the audience that this group of teens was extraordinarily brilliant, just by choosing a few choice "academic scenes" where they're solving extreme 3-D (or more) math or engineering problems, for example. I also understand why they chose to go this way: working with a cast of 6-year olds would be difficult and probably not all that successful. Plus, although Ender was "discovered" and did remarkable things at the time he was six, the book portrays YEARS passing while he goes to Battle School, and then moves on to Command School. The movie no doubt compresses all that considerably. So, if we could agree that it's the FINAL confrontation that needs to be "most accurate," then it is not a terrible stretch of imagination to get from the book's 12-year olds to the movie's "young teens."